From let to right: Shannon Hearn, Kayla Hearn, Jodee Storm Sullivan, Keely Eure, and USC Annenberg School for Communication and Journalism Dean Ernest J. Wilson III, Ph.D., pose for a photo during the halftime of the Lakers - Hawks game. The Hearns and Lakers presented the annual Chick Hearn memorial scholarship to Sullivan and Eure. The spotlight was on two USC Annenberg students Sunday night at Staples Center, where they were presented with the 2016 Chick Hearn Memorial Scholarship in a ceremony at center court. Keely Eure (B.A. Broadcast Journalism, '17) and Jodee Storm Sullivan (B.A. 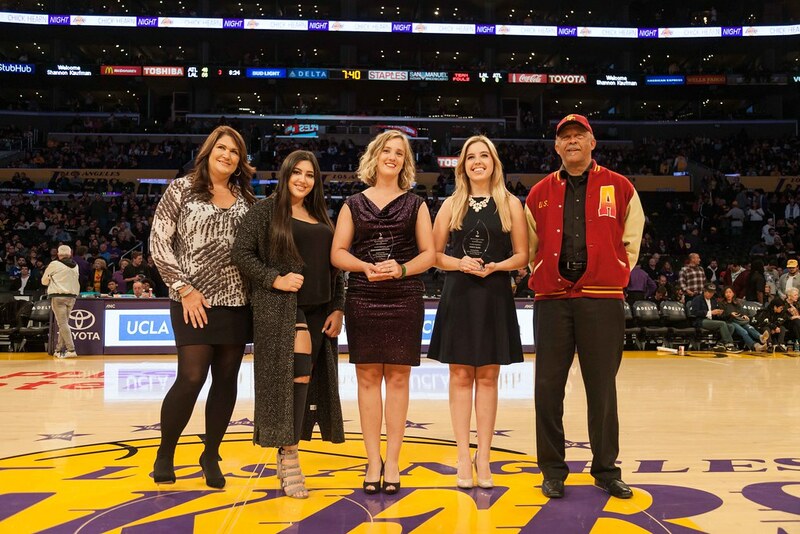 Broadcast and Digital Journalism, '18) received the award from the Hearn family and Annenberg Dean Ernest J. Wilson III during half-time at the Lakers vs. Hawks game, which fell on what would have been the late legendary announcer's 100th birthday. "To be at the Staples Center and receive this award on Chick Hearn night was such a special experience," Eure said. "Hearn helped shape the world of sports broadcasting, and I'm so honored to be associated in any capacity with such a legend." For Sullivan, a lifelong Lakers fan, the experience was a dream come true. "I have always dreamed of getting to be on the court at Staples Center," she said. "Growing up, I didn't know how I would get on the court, but I knew that I wanted to be down there." Each will receive $6400 in scholarships, which is given annually to USC Annenberg students planning a career in sports journalism. The scholarship will help Eure pursue her goal to become a sports broadcaster. "I love being where the action is - whether that is on the field or the court," she said. "In the future, I would love to cover a college football team or a baseball team." Sullivan hopes that the scholarship will lead to connections that will help her pursue a career in sports journalism. "I had the pleasure of meeting people who work for ESPN, Spectrum and the Lakers just through the ceremony on Sunday," she said. "I'm hoping to use the connections I've made through this scholarship to help with an internship heading into my senior year at USC." Keely Eure is senior studying Broadcast Journalism with a minor in Sports Media Studies at the Annenberg School for Communication and Journalism. For the past three years, Eure has been an intern and reporter for USCFootball.com, where she is responsible for sideline coverage during games and practices, coach and player interviews, and shooting highlights. In addition, she is an executive producer and anchor for Sports SCene, a student-run weekly 30-minute show on the award-winning Annenberg TV News Network. Eure also hosts and produces the USC sports podcast, The Sound of Troy. Most recently, she spent her summer working for ABC 7 covering Dodgers and Angels Baseball. After graduation, Keely hopes to continue covering college football and Major League Baseball. Jodee Storm Sullivan is a junior majoring in Broadcast and Digital Journalism with a minor in Narrative Structure at the Annenberg School for Communication and Journalism. Since her freshman year, Sullivan has been involved with Annenberg Media, where she is currently the Sports Director of Annenberg TV News. She was also one of the station’s Sports Anchors and Art Directors. In addition to working with Annenberg, Sullivan is a sports columnist for the Daily Trojan. Sullivan aspires to be a color commentator, host of her own sports show or a producer.